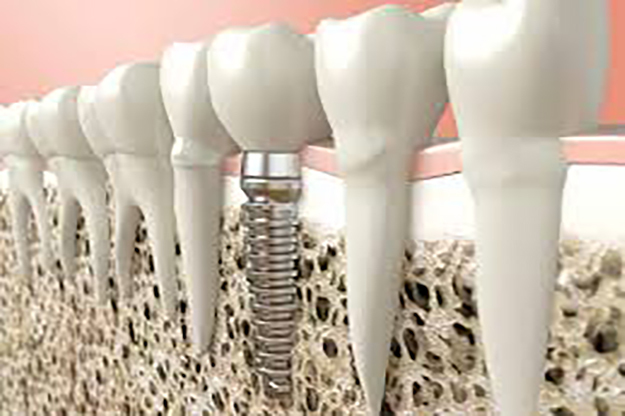 Dental implants have been a boon to many patients. Not only do implants provide options to avoid loose and poorly fitting dentures, they can be used to provide crowns and bridges avoiding placing at risk the natural teeth that traditionally have been used to secure fixed dental work. 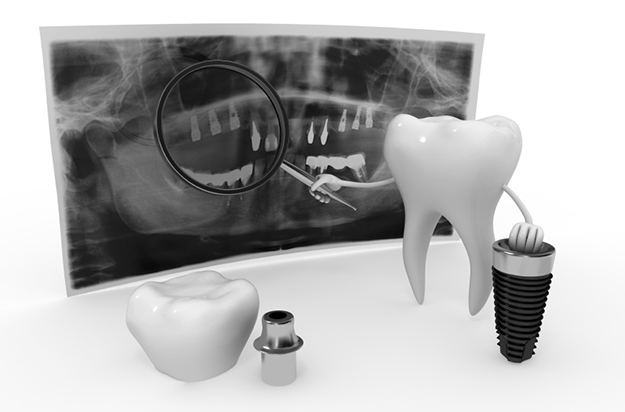 Implants have truly revolutionized modern dentistry. With all the good news about implants it is easy to overlook the few but important problems that can arise with this type of treatment. Implants can experience bone loss. This can happen for several reasons. First is inadequate home care. Although implants cannot decay they still must be cleaned daily to the best of your ability. Bacterial accumulation around the base of the implant where it meets the gum tissue will cause inflammation and if left long enough can induce bone destruction. Therefore it is essential that you clean the implants daily. Each implant and restoration is unique so there is no cookbook approach to what works best. Certainly brushing is essential. Automated brushes can be more effective in some case but are not usually mandatory. Using some thicker forms of floss that can frame out and adapt to the implant surface. Some patients find that a thin yarn works very well. Regardless of your efforts some bacterial will work into places your homecare cannot reach. Professional cleanings on a regular basis will be needed to address this problem and maintain health tissue around your implant. The frequency of such cleanings will be based on you previous history of periodontal disease problems. If you have a history of periodontal bone loss you need to be seen on a more frequent basis. If you have active periodontal disease on your natural teeth it is essentially guaranteed that your implants will lose bone as well. Other health issues can affect the survival of your implants. First among these is smoking and other uses of tobacco. Tobacco use shortens the life of dental implants. Ideally you should quit before beginning the treatment process. If you have implants and are currently smoking quit or at the very least reduce your frequency of smoking dramatically. While you still with have the systemic smoking risks the topical effect on the gum tissue will be lessened. Poor management of systemic diseases, particularly diabetes, can make bone loss more likely around your implants. High blood sugar depresses your immune system function allowing more aggressive bacterial to grow around your implants. Following your doctors recommendations to keep blood sugars under control will help limit any damage. Excessive bite forces can induce bone loss around implants. Unlike natural teeth, implants do not move, they are fixed into the jawbone. Great care is taken during the construction of your dental restorations to minimize the risk of too much force being placed on the implants. However as time goes forwards your teeth can shift and wear, you may have other restorations placed the shift the bite slightly and in younger patients some delay facial growth can result in the implants coming und increasing bite forces. This happens slowly so it is not very noticeable to you. After a certain point the increased forces can begin to cause small fractures in the bone where it meets the implant. If not dealt with early this bone loss is progressive and can result in the loss of the implant. To minimize these problems the bite on the implant should be checked at least once a year. It must be checked any time you have other dental work done. Even with the best care, some problems may be unavoidable. We are just now reaching a time where a significant number of implants are in the range of 20+ years old. Most of these implants have reached this age with minimal problems. It does appear however that due to long term bone turnover some implants develop gum tissue problem for no apparent reason other than they have been in service for a long time. Fortunately most of these problems can be dealt with and rarely do they cause the implant to fail. 1) Avoidance. Be sure to check with your dentist that you do not have active periodontal disease before beginning implant treatment. 2) Quit smoking and other uses of tobacco. Keep other systemic disease such as diabetes well managed. 3) Once your implants are restored have your dentist check the bite, several times if needed, to assure the implant is not overloaded. 4) Be sure to do your best to clean your implants daily. 5) Remain faithful with your professional cleaning visits. 6) Ask to have the bite checked anytime you have new dental restorations placed. 7) If you have problems with your implants deal with it early. Small problems are easier and less expensive to fix. Dental implants have been truly revolutionary. Yet no treatment is a panacea. Each therapy option brings with it a unique set of risks that if ignored can endanger the long-term success of your implants. Taking these simple steps can go a long was to assuring the comfortable functions of your implants for many years.